When you're shopping for new wheels, there are certain things you should keep to yourself. NEW YORK (CNNMoney.com) -- In a car-buying transaction, even the nicest, most honest car salesman has interests that are very different from yours. He's paid to sell you what his dealership has at as large a profit as possible. The better he does that, the more he, and the dealereship, make. You, on the other hand, want the best car you can get at the best price you can get. Welcome to capitalism. At some point, you have to negotiate those conflicting interests. As in all negotiations, there are certain things you definitely shouldn't let slip. Working with Phil Reed, consumer advice editor at Edmunds.com, we boiled down the six things you least want to say when you're shopping for a car. Even if a car has your heartstrings in a white-knuckled stranglehold, never let on. Stay calm and pretend you're looking over a microwave oven. By admitting that you're smitten, you've given a salesman - and the sales manager and everyone else in the process - the combination to your personal safe. They know you're not about to walk away. Bottom line: Cars you're not in love with are usually a lot cheaper. If there's anything worse than being in love, it's being in desperate need. Letting on that you need a set of wheels immediately is, basically, telling the salesman "I won't be thinking too much about any of this." He knows you won't be looking too closely at the particulars of the deal and you aren't likely to drive across town to try to get a better price. It also means you're more likely to accept whatever he shows you from the dealership's inventory even if it doesn't exactly suit you. In other words, you may be presenting yourself as an opportunity to unload a bit of slow-moving inventory. Even if you really do need a car quickly, act like you have a month to decide. But you would consider buying today if you found a car that really pleases you at a price you like. It's understandable that many car shoppers are "payment shoppers." Most of us have no idea how much car we can afford except by looking at how much it would cost us each month. But saying "I want a payment of less than $350 a month" is like going into a box store and asking for a two-inch box. You'll notice that some dimensions are missing. You could end up with a box that's 12 feet long. Almost any given monthly payment is possible provided the loan is long enough and the downpayment is big enough. Over the course of, say, seven years, $350 a month can add up to a lot more than $350 a month for three or four years. 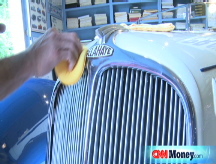 To understand how much car you can really afford, you need more than a monthly payment figure. Know what monthly payment you want, for how long and how much you want to pay up front. You also need a fairly good idea of what your trade-in is worth. To keep it really simple, just figure out what price you can afford for the car -based on your monthly budget and trade-in value - and negotiate that one big number. Talk about downpayment and monthly payment and negotiate the value of your trade-in after that. A salesperson will usually want to know, early on, if you have a vehicle to trade in. If you tell him that you do and that it's parked, conveniently, right outside, he'll ask you for the keys. That way the used car manager can assess its value while you're negotiating. It'll save time. Well, he has a point there. But consider the downsides. You've just handed the salesperson your car keys and he's given them off to someone else. Guess what's going to happen if you reach an impasse in the negotiations and decide it's time to leave. You'll have to ask for you car keys back. And, odds are good, they will have been misplaced. You'll be negotiating a while longer. Even if you're never going to lease a car, you need to know about leasing, if only to know exactly why you're never going to lease a car. That's because there's a good chance someone will try to sell you on the idea. And they might be right. It could be a good choice for you. But it probably isn't. First of all, leasing makes sense only for people who know - really know - they will not be keeping a car for more than a few years. Beyond that, you need to understand the terminology and costs of leasing beyond the monthly payments, the number salesperson will focus on. You need to know how many miles are included in the lease and if there's additional money you need to pay up front or at the close of the lease. Many people underestimate their own credit rating - and they're the people who are big moneymakers for car dealers. Part of the interest you pay is shared with the dealership, so they might be pleased to confirm your belief that you don't qualify for a low interest rate. To make sure you're getting the best financing deal, secure your own financing before you start shopping. Having another loan in place - one you can use if you don't like what the dealership is offering - gives you negotiating power. It also lets you know exactly what you qualify for. In most cases, a dealership's finance office - working with a manufacturer-affiliated auto financing company - should be able to get you a more-than-competitive rate.